Or do I reflct you? O.o His eyebrows, they’ve shrunk painfully small. o_O This is shocking no? Maybe we’re actually seeing the mirror-universe Biff, who doesn’t have long eyebrows. Who knows? Just like Spock and his beard! I swear I almost did this once. i used to try as a kid. still working off 21 years of bad luck, though. I think I did this in the middle of a shop. It had too many mirrors and was confusing. I was also quite scared that I was walking towards myself. Meh…Nova’s stupidity. Oh dear. I’ve done that. I’ve done that with everything from mirrors to the SOLID BRICK WALL OF MY SCHOOL CAFETERIA. Curse inconveniently placed solid objects! I’ve run into a patio door a couple of times before… not fun. i broke two mirrors my whole life… and I’m only 13! only…….. 34 more years of bad luck left to go. i was walking backwards talking to this really pretty girl and guess what happened- I WALKED INTO A BRICK-WALL. IMAGINE HOW GOOD I LOOKED IN FRONT OF HER. Poor Biff, duck next time! You know… without his eyebrows and mouthstache, biff looks bald. The Marx Brothers movie with the not-mirror scene was “Duck Soup”, actually. And it was the best movie evar. Period. The guy in the mirror stole Biff’s marvelous eyebrows! 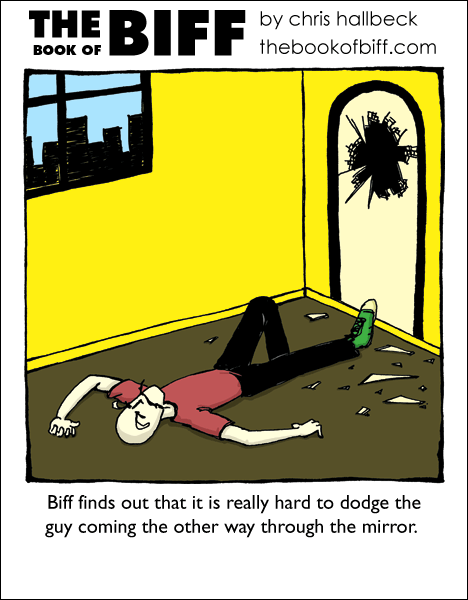 I actually had that experience in a house of mirrors. I was running around when I saw myself in the other direction, and I sort of panicked and kept running, trying to dodge me, and then BOOM! I did this, except with a tree, and it was stationary. I’m reading them all – again – and this one is one of my favorites since the start. Does anyone else think of a certain Rugrats episode when they see this?